The Irvine Folk Club which meets fortnightly on Wednesday nights In Vineburgh Community Centre. The venue is wonderful for music with great acoustics and a friendly audience. There is no bar but you can bring your own drinks. Soft drinks, teas, coffees and snacks are available during the break. The Irvine Folk Club is one of the oldest folk clubs in Scotland with a well earned reputation for great music for over 50 years. 2016 is the 50th year of the Folk Club – which is the longest continuously running folk club in Scotland. 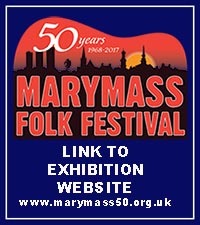 The Marymass Folk Festival, which is closely linked to the folk club, celebrates its 50th anniversary in 2017. The Marymass Folk Festival, which runs each year in August, is also organised by Irvine Folk Club.